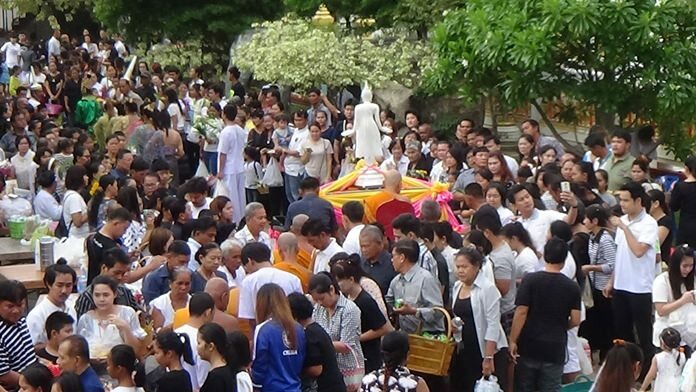 Overshadowed by the passing of HM the King, Buddhist Lent ended on a somber note with people flocking to area temples, but largely to mourn their beloved King. 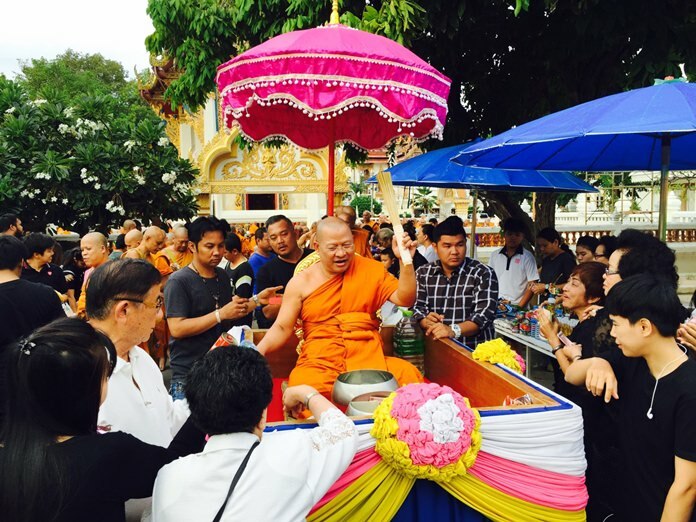 The abbot at Wat Chaimongkol blesses the congregation with holy water. Chaimongkol, Nongyai, Thamsamakee and other large temples were busy, but the atmosphere Oct. 16 was very subdued as Thais mourned for HM the King who passed away at age 88 four days earlier. 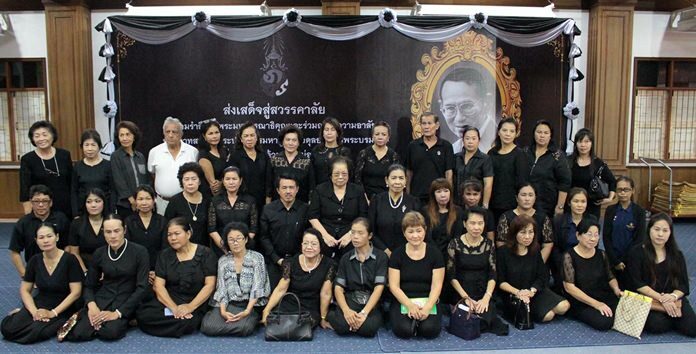 On Sunday evening, Chai­mongkol temple held a meditation ceremony for merit makers and gave people the opportunity to mourn HM the King Bhumibol Adulyadej together. 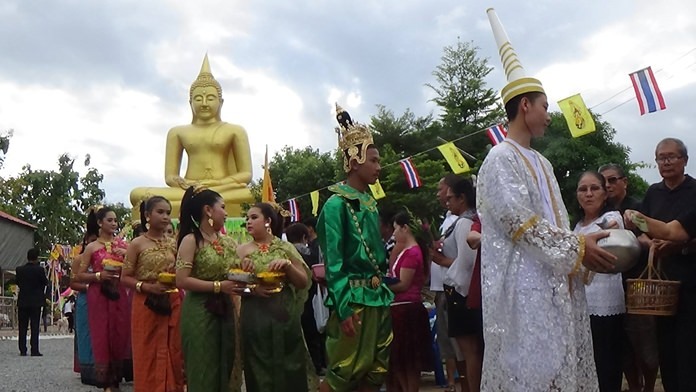 In Sattahip, temples seemed busier than last year’s Auk Phansa, due largely to the King’s passing. Believers dressed in black or white mourning clothes as they began filing in to temples in the early morning. 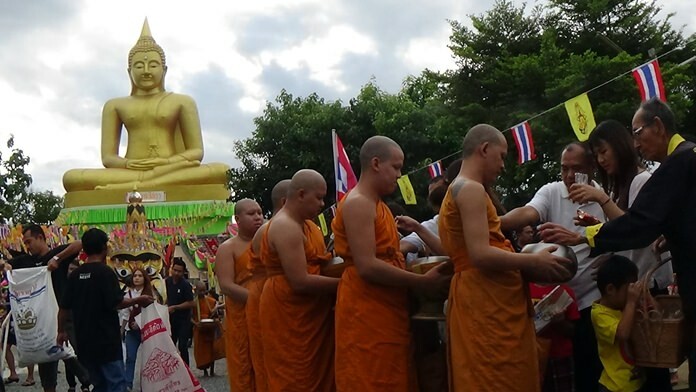 The abbot of Wat Sattahip led 53 monks to collect alms before the traditional “tak baht” ceremony. People observe the holy day at Wat Nongyai. People offered a variety of goods, from beverages to dried food, rice, fruits and more. Residents believe that the more merit they make, the more prosperous their year will be, even during a year of mourning. Tak Bat Devo, derived from the Sanskrit word “Devorohana,” is celebrated at the same time as Auk Phansa, the end of Buddhist Lent. Almost always centered around a temple on a hillside, monks who’ve been in their “rains retreat” for three months emerge in a procession of saffron robes down the hill depicting the path Buddha took down a “celestial stairway” made of silver, gold and crystal. 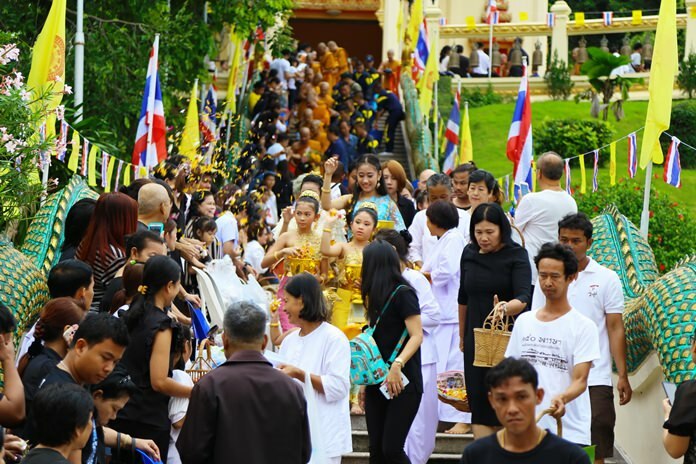 Thousands of worshipers made a pilgrimage to Wat Nongyai to observe Auk Pansaa and Tak Bat Devo. Monks collect alms as is tradition. 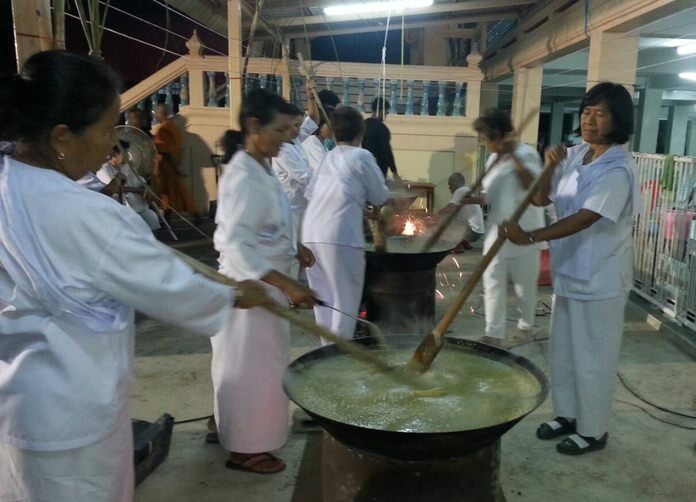 Expert cooks create tip rice at Wat Khao Phothong in Nongprue for the occasion. Worshippers at Wat Chaimongkol mourn their beloved King. 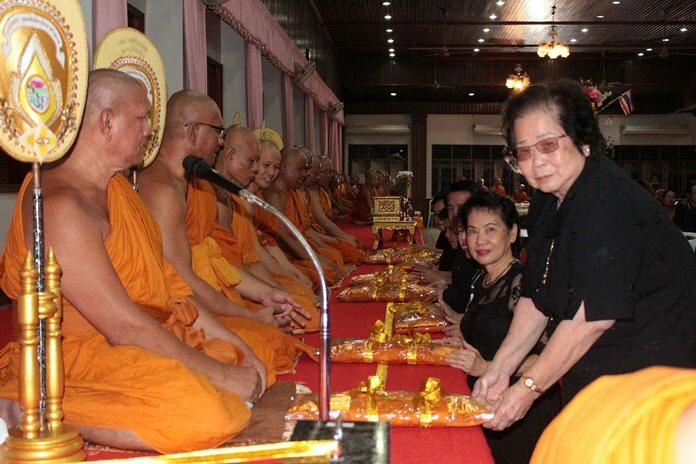 Devout Buddhists present robes to monks at Wat Chaimongkol for Tak Bat Devo. 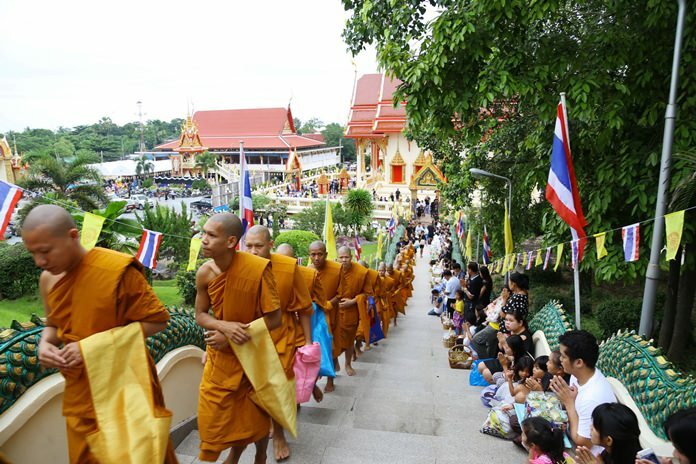 Monks in Sattahip climb the celestial stairs to prepare for the Tak Bat Devo ceremony. Monks and lay people alike take part in the Tak Bat Devo procession down the hill depicting the path Buddha took down a “celestial stairway” made of silver, gold and crystal.